Apparently having the 4G playing field to yourself isn't all it's cracked up to be, as the UK's only LTE provider is getting a bit lonely. Speaking at a press briefing in London EE's Director of Network Integration & LTE, Mansoor Hanif explained the network's position in the market and what it makes of the competition. "We're happy and we're actually quite surprised the others have been slow, we're feeling a bit lonely." 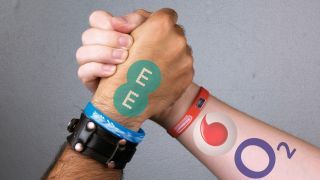 So EE is welcoming the 4G competition and seemingly can't wait for the likes of O2, Three and Vodafone to join the fray later this year, with Hanif adding: "we want clear, fair competition". There's still plenty of consumers to convert to 4G, as EE confirmed it had hit the half a million mark and is on track to have a million super-fast customers by the end of the year. That said Hanif still believes EE will offer the best service out there at every stage of 4G's development: "our ambition is to be ahead of everyone else". It's a taunting battle cry from EE to the other carriers in the UK and you can be sure O2, Vodafone and Three will come out all-guns-blazing when their 4G services launch.